If a very powerful subwoofer - in a cabinet that is not too big - is required, we must remember that this subwoofer has to move lots of air as well. The SPH-380 TC is quite capable of doing that with a peak linear displacement volume of 960 cm3 (diaphragm surface area x voice coil overhang). The driver features a twin voice coil with 2 x 4 Ohm, a power handling of 500 Watt RMS and was tuned for use with a small cabinet. 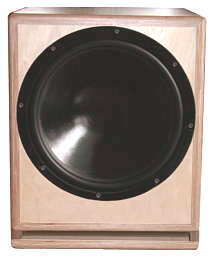 The picture below, left shows how the subwoofer performs in a bass reflex and in a closed cabinet version. The closed cabinet version shows a clearly more accurate bass - but without going that low. The maximum sound pressure level at lower frequencies, however, is considerably higher when using the bass reflex version (in our example the sub is optimally tuned for bass reflex). The bass reflex version is standard according to textbook (Hoge). The subwoofer achieves then 28 Hz resp. 36 Hz (-8 resp. -3 dB). Just try both version (it's easy to close the bass reflex port). If you prefer the closed cabinet version we'll gladly supply the decade resistors for more low bass (or you correct the frequency response with the integrated digital signal processor). The low bass properties of Audaphon AMP-24 with digital signal processor and two power amplifiers, which are used in bridged mode are adjustable. We recommend, however, to use the neutral setting first. 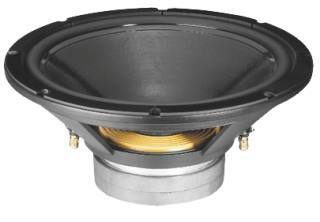 We believe it's the best setting for low bass. If you don't need very loud sound reproduction, and if you don't need a digital signal processor, we recommend the amplifier Mivoc AM 80 MK II. 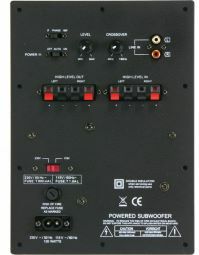 Subwoofer module Mivoc AM 80 is a module with gain control, cut-off frequency control and phase inversion switch. RCA sockets (to connect to pre-amp out) and binding posts (to connect to the main amp) are available. The satellites may be looped through the module. Required cut-out see description of the module.